We've got a big issue of Between the Sheets this month. The sailing season is in full swing. Many events and activities have already taken place, and there are also lots more planned for the near future. Rather than have me take up more space with my own musings, I encourage you to read carefully all the articles below so that you, too, will know what's going on and can choose those events and activities in which you would like to participate. See you on the water! Saturday, May 20, dawned dark and wet, but by 1:00 p.m., the rain had let up and the sky was a bit brighter. 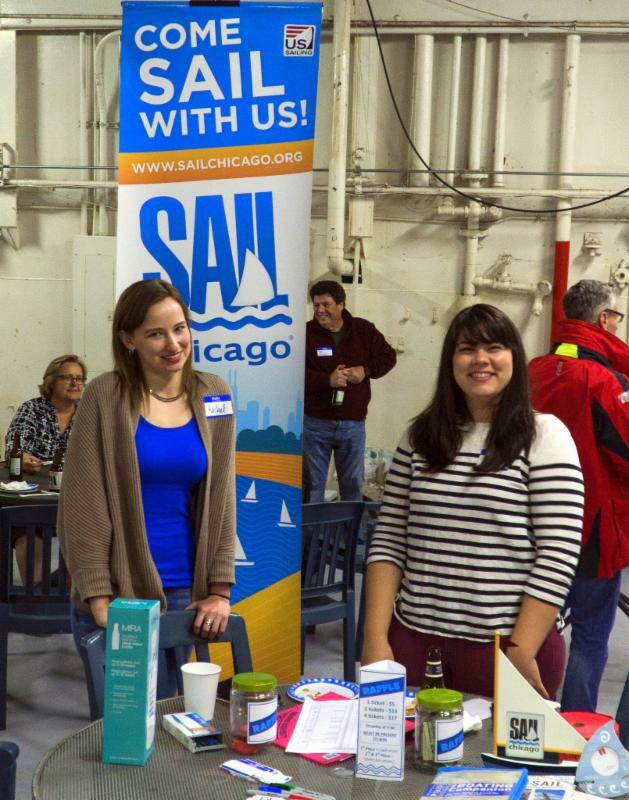 Almost 50 Sail Chicago members and friends gathered at the Columbia Yacht Club's "big blue boat" to celebrate the start of another sailing season. Our new cruising boat, Calypso, was tied at the dock so that both members of Sail Chicago and the Yacht Club could get a close look at her. Inside, there was beer, soft drinks, and snacks for all. There was also a raffle to raise money for our fleet renewal program. Bob Knapp won the raffle, receiving a cash prize of $50. Many present also entered a knot-tying contest. 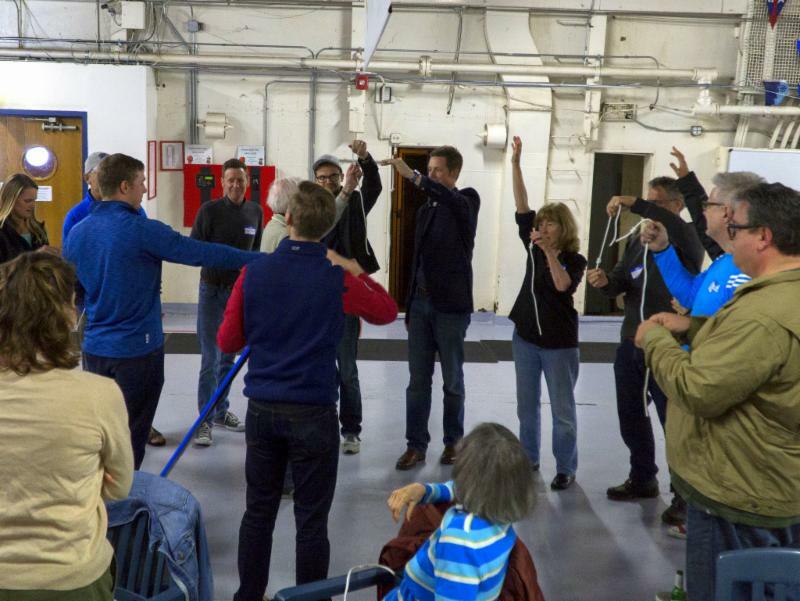 After member Norris Larson demonstrated how to tie a number of nautical knots, Jason Wirth organized the contestants. Simeon Stairs was the big winner, and much fun was had by all. Thanks to Sarah Pellegrino, Board Member for organizing the event, to our new Social Coordinator, Mary Therese Hennessy, and to Social Committee/Fundraising Committee members, Alexandra Harper and Rachel Granneman, for planning the raffle. Sail Chicago has partnered with Lawrence Hall Youth Services since 1996 by providing sailing experiences for under-privileged youth in the Chicago area. Every other Thursday afternoon during the summer sailing season, one of our cruising boats, Priorities, leaves Belmont Harbor with 3-4 Lawrence Hall youth and a chaperone aboard, to experience the fun and excitement of sailing on Lake Michigan. 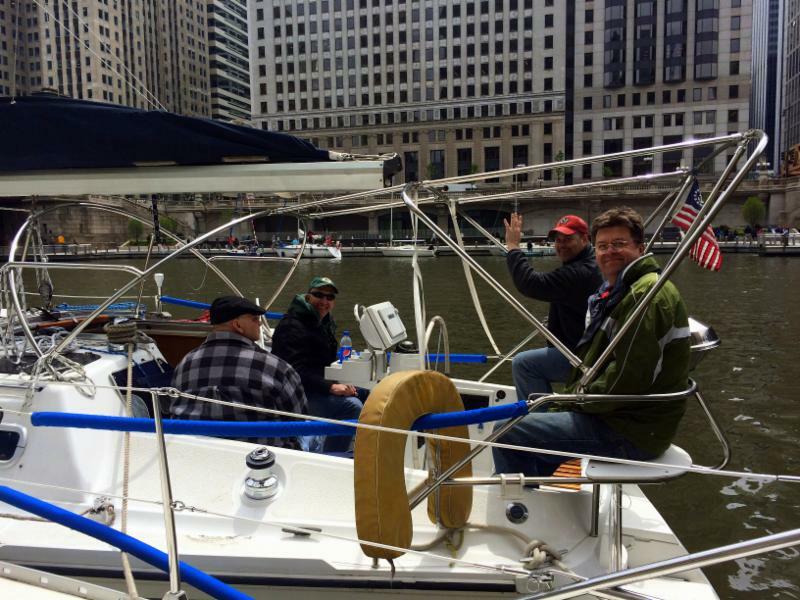 On Saturday, May 13, I had the privilege of participating with four other Sail Chicago members in an orientation on Calypso, our new Erickson cruising boat. 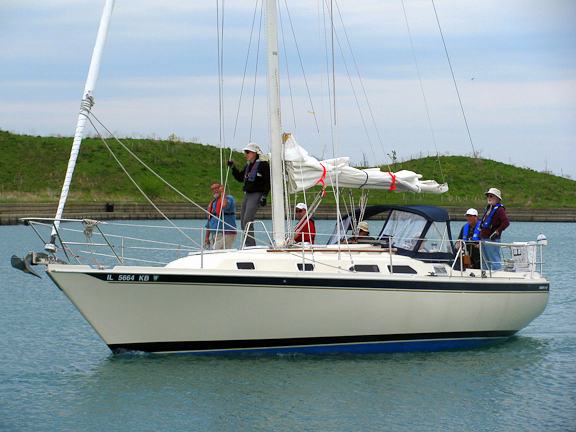 I was frankly a little skeptical about Sail Chicago's need for a second boat as part of our cruising program, and I was curious to see if this boat would be worth the cost. Calypso is located on the O Dock on the west side of Burnham Harbor, half way between Soldier Field and McCormick Place, only a short ten-minute bike ride from the tender dock at Monroe Harbor. The first thing that impressed me was the clean restroom facility just south of the dock, both close and convenient. The boat itself is in pristine condition. The controls are easy to manage, and the diesel motor is very responsive. I understand that the former owner kept it in fresh water and only sailed it a couple of times a year. Simeon Stairs, the Boat Manager, and his maintenance crew have done a great job at readying it for service this summer. The day was beautiful, with strong, steady winds of about 15-18 kts. Norm Linde was our orientation master. We motored out of the harbor, and, as the wind began to pick up, we decided to reef the mainsail. This was particularly easy, because all reef lines are handled from the cockpit, and no one has to be on deck for the procedure. We put Calypso through her paces, tacking, jibing, sailing close-hauled and on a beam reach. When it was my turn at the helm, I found her very responsive to every turn of the wheel, with very little weather helm, even in the strong winds. Docking as a different story. A strong southwest wind like we had tends to push the bow of the boat away from the dock, so a strong forward throttle with a quick reverse is necessary to make sure the boat heads straight and true and stops in time. I'll need a little more practice before I feel really comfortable with this procedure. But, all in all, my orientation was a great experience, and I think the boat will contribute much to our Cruising Program. Cruising skippers who want to refresh their acquaintance with Priorities can now do so. In the my.sailchicago.org website check for "Refresher" under Seat Availability. If you are one of our new Colgate skippers (we had a record 42 new skippers last season), we are initiating a Skipper Mentor Program to help welcome you as members of Sail Chicago. This program is meant to help those who might like some advice on the Do's, Don'ts, and Culture of our unique community sailing organization. If you would like to be paired up with a Sail Chicago mentor, contact Lead Instructor, Matt Stuczynski. Mentors will be a "go-to person" for questions about the group, seamanship, and general knowledge and advice. In some cases, mentors might also accompany new skippers on practice sails (especially at the beginning of this season) to enable these new skippers to follow our rule of only going out with an experienced skipper during their first, full year of sailing. Calypso - 5 sails for $450. These sails may be used during any rental period and reduces maximum rental charge to $90 per rental period. Click here to register. Welcome to this season's Tiller Time. More Skippers Are Needed We need seasoned skippers to lead Tiller Times. If you'd like to share your knowledge and love of sailing with our current member students, this is the place for you! Also, if you are interested in becoming an instructor in our Instruction Program, but aren't quite sure, this is a great way to find out. The timing of Tiller Times is flexible and can be built around your schedule. If you think you might be interested in trying this out, please let me know. All I'll need are the dates and times you might be available. And thanks for your help! John Lemon, our Safety Director recently told us that the Grant Park Garages are offering discounted parking for online only purchase. If you're planning to sail out of Monroe Harbor and are driving down, you may want to check out the rates. Every year the Coast Guard compiles information on recreational boating incidents and fatalities. Sadly, for 2016 compared to 2015, there was a 12% increase in fatalities, an 11% increase in injuries, and a 7.3% increase in accidents. According to the Coast Guard, operator inattention, operator inexperience, improper lookout, excessive speed, and machinery failure ranked as the top five primary contributing factors in accidents. Further, alcohol use is the leading known contributing factor in fatal boating accidents. More alarming: 80% of the 701 fatalities were drownings, and of those, 83% were not wearing life jackets. "Wearing a life jacket, regardless of whether or not a state or federal law requires one to be worn, is the single greatest factor in preventing death from drowning," said Capt. Scott Johnson, Chief of the Office of Auxiliary and Boating Safety at Coast Guard Headquarters. "All boaters should wear a life jacket at all times when on the water, no matter your age, physical ability, or condition." The most important conclusion we can draw from this report: Wear your life jacket. Period. 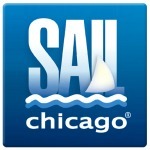 Sail Chicago requires that everyone participating in an official sail (class, Tiller Time, MCO, maintenance sail, etc.) wear a life jacket at all times while on or near the water. You can read the full Coast Guard report here. GREAT BOOKS FOR SAIL CHICAGO SAILORS! I just returned from a week at the beach and caught up on some reading. Two of the books I read may be of special interest to Sail Chicago sailors. I thoroughly enjoyed Dirty Waters by R.J. Nelson. I heard Nelson speak during the winter and put his book on my reading list. The sub-title is "Confessions of Chicago's Last Harbor Boss." Bob took over harbor management during the Harold Washington administration with the task of cleaning up corruption in Chicago Harbors. (The previous three harbor bosses were in federal prisons on corruption convictions.) 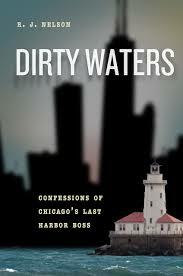 It is a fascinating insight into the Chicago Harbors. Maneuver and Dock Your Sailboat Under Power was written by Grant Headifen and is full of exercises that demonstrate techniques that help us maneuver our cruisers in many different wind situations. The book contains many QR codes that take you to animations that demonstrate the maneuvers. Sail Chicago will be conducting docking classes based on these exercises. You may want to pick up a copy. Chris Schuler will meet with Columbia Yacht Club to work out details of our continuing relationship. Sail Chicago students who could not find seats in sold-out Sail Chicago classes will be encouraged to contact Columbia Yacht Club. These students will do their class with Columbia Yacht Club instructors on Sail Chicago boats. Both Sail Chicago and Columbia Yacht Club are pleased with our relationship so far. We appreciate use of their docks and facilities. They will also fuel our boats and provide assistance to our boats on the water with their powered RIB. More details will follow as the relationship is further developed. Sail Chicago is researching email handling systems to better track incoming emails. We are not satisfied that they are handled in a timely and competent manner. The next meeting will be a phone-in meeting on June 8.